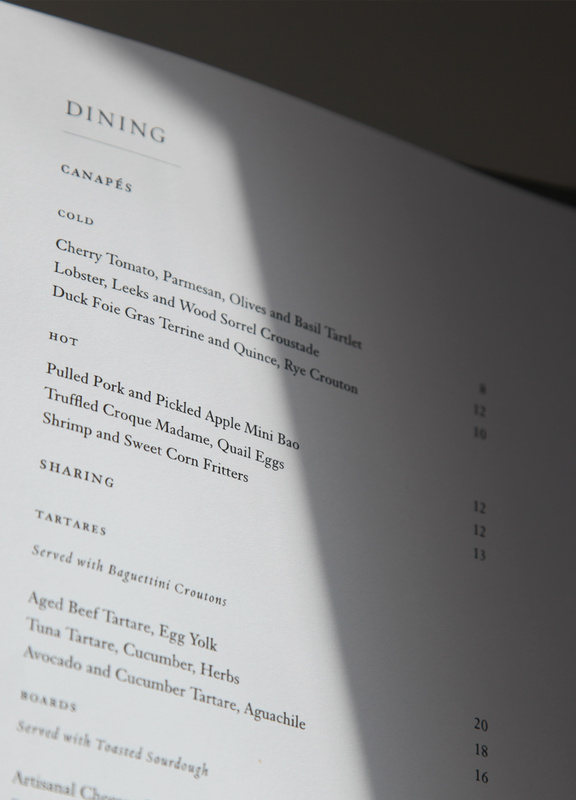 As we began this project we had a specific brief to devise a menu system that retained all the elegance you would expect from a menu at one of London’s best hotels – with a pre-determined format. In other spaces in the hotel, particularly the Holborn Dining Room, an A5 folded menu using thick card had proven successful, so we were charged with rolling out this model to The Mirror Room. For us, the challenge was finding a way to ensure it was the kind of ‘five star’ menu Rosewood were looking for, within this medium. We worked with GFSmith to choose ‘Smoke’, a paper stock from their Colorplan range. 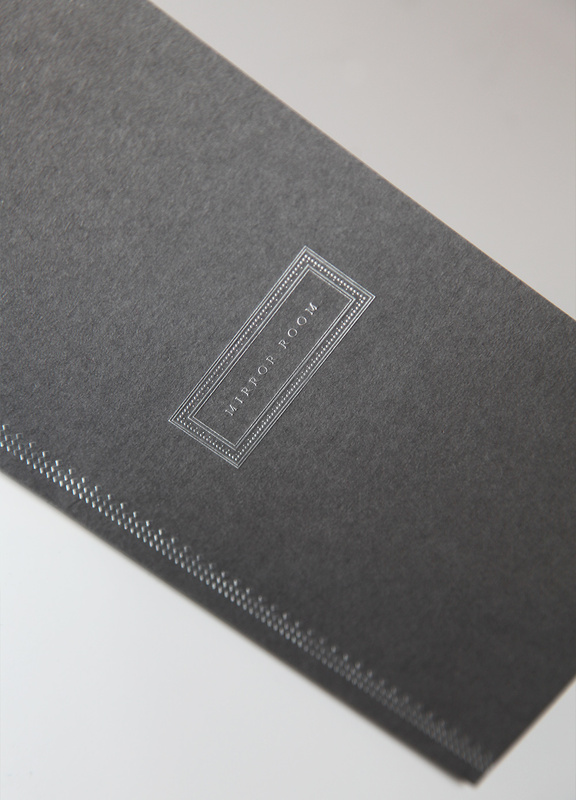 We then drafted a design using greys throughout which was silver foil-blocked on to the cover. No designer really loves practical concerns, but in a busy restaurant any kind of paper is going to show up finger-prints and marks. Even that is before they have scuffs, dents or bashed corners. Needless to say, these menus need some kind of shelf-life. So despite it taking away GFSmith’s beautiful uncoated paper finish from the outside, the menus have been matt-laminated so that at least they could survive the wipe of a damp cloth. What it means is that the cool, perfect colour is maintained alongside an easy-to-change system of a smart fabric elastic band to hold the menu in place. The result is that on-brand, practical system is created. 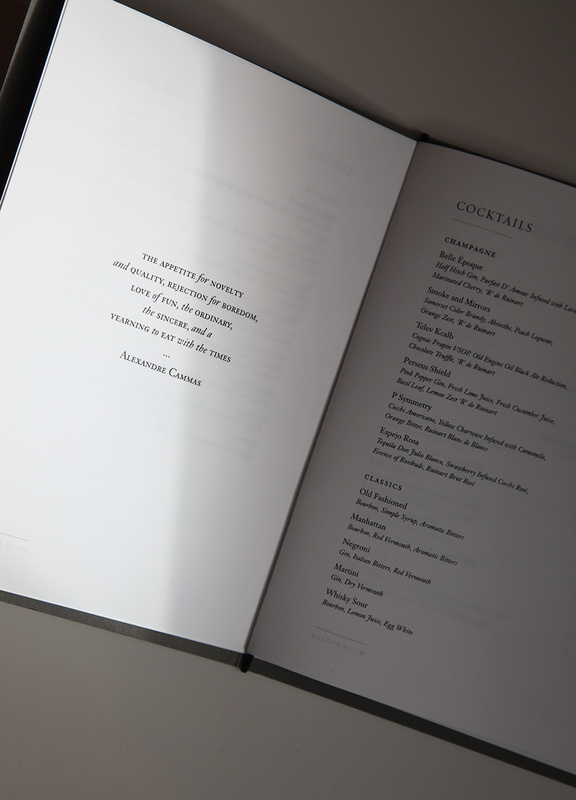 As a companion piece to the menu, we have also devised a card which is presented to Mirror Room clients at the end of the meal containing their bill. We had a look at a wide range of different ways of doing this – in part by looking at what other hotels and restaurants use. Then, with the encouragement of the marketing team at Rosewood, designed something bespoke for them. A little larger and taller than the design we started with, this finished folder is rather a smart end result. A satisfying end result for a very simple project. We have completed a series of projects for Rosewood focussed on design solutions that work specifically for them. These are always with their brand in mind – but we aim to offer a smart and interesting take on the briefs we receive every time.